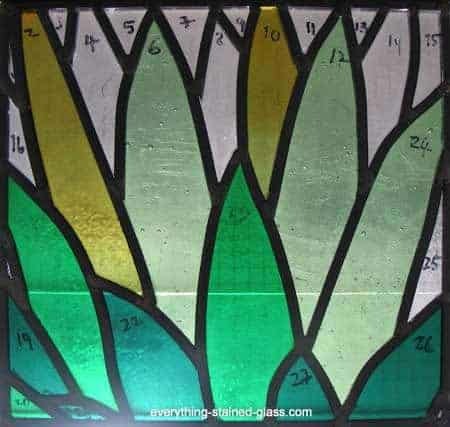 Stained glass soldering is one of the most exciting steps because it allows you to pick up your panel and see the coloured light coming through it for the very first time. Woo hoo! 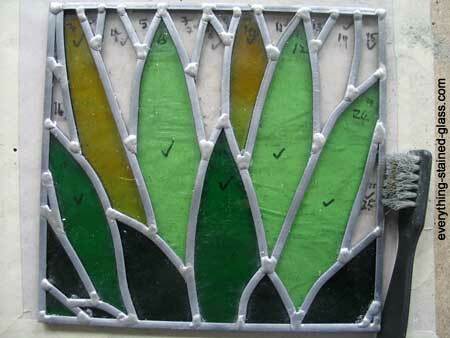 Students of my online leaded stained glass class really got the hang of this. They found out how to solder stained glass so that it’s both strong and neat. 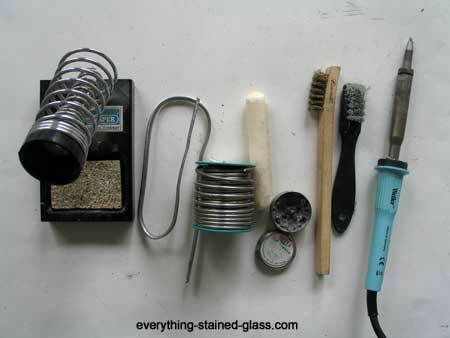 Clean each joint with a wire brush. This gets rid of any oxidation or dirt that may have built up on your lead came. You need a clean surface so that the solder will adhere properly. It’s best to solder immediately after cleaning. This will stop any oxides building up on your lead joints. If you’re a beginner, it’s a good idea to cut off some pieces of scrap lead and practise how to solder stained glass by soldering joints along the lead. This way you can get the feel for the way the solder melts, and how hot your iron needs to be. Soldering fumes are dangerous. Try to do the soldering process by an open window, or buy a portable fume extractor if you’re going to do large amounts. Brush flux on to a lead joint. If you’re right handed, place the end of the stick of solder right over the join with your left hand. Don’t hold it too close to the end. The solder heats up along the stick and you could get burnt. Bring the hot tip of the soldering iron to the solder over the join. A drop will melt off onto the joint. It’s better to put a small amount on first and add more. 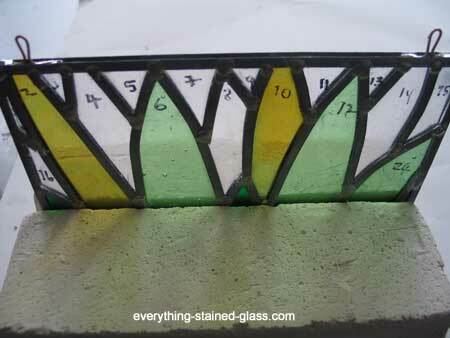 Stained glass solder sticks to the lead and is difficult to take off if you’ve put too much on. Hold the soldering iron still on the solder for a few seconds, letting it find its natural level. It should be a little rounded and covering the whole of the lead join. Be careful not to take too long because the solder will melt too much and disappear through the gap. Both the lead and solder need to heat up for a strong union. Try not to touch the lead directly with the tip as it could melt it. Make sure you have soldered every joint. It’s easy to miss one or two. 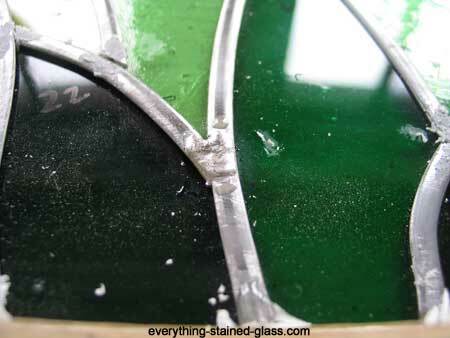 I have a video on this page here that takes you through 3 Common Stained Glass Soldering Mistakes and shows you how to rescue them. Be very careful turning your stained glass panel over. It is very fragile at this point. Wait until the last solder join has cooled down. Slide the panel slightly over the edge of your work surface and lift it upright. Lean it over carefully, supporting the back with your left hand. Now clean the joints with a wire brush and solder the back side as above. If you have gaps at the joins where the lead doesn’t fit very well, you can fill them in with little bits of lead cut from a spare flange. Do this one by one, otherwise they’ll fall off. If your panel is for hanging in front of a window and doesn’t need to be waterproof, you can add some hooks on at this point. Solder the hooks carefully on to the border lead with the tip of the soldering iron held vertically. Q. My stained glass soldering isn’t smooth, it’s all crinkled. A. Either you haven’t held the iron on the solder for long enough or it’s not quite hot enough. You can re-do these joins but make sure it cools down before you redo otherwise you might melt the lead came. Q. My joints are all messy. A. You might be moving the soldering iron when you’re melting the solder. Add a little more solder and try to keep the iron still when you melt it. Q. My solder melts into the space between my lead. Q. My solder rolls off and won’t stick. A. Either you don’t have enough flux, or the joint is still dirty. Try more flux, and if it still doesn’t stick, then clean it again with a wire brush. Q. My iron isn’t melting the stained glass solder. A. Your tip may be dirty or have excess solder on it. Clean it by wiping it on a damp cloth. Or the thermostat is set too low. Turn it up a little and wait before testing it on a scrap piece of lead. If you’re not sure which soldering iron is best for you, there’s a page here that will help answer your questions. I’ve found a video that will give you an idea of how to solder stained glass, although I’m not too sure how good the joints are in the background – one looks a bit melted! Don’t panic! I’m assuming it’s a leaded piece as you say you’ve soldered just the joints? If so, you can’t remove it but you can touch them up and improve them. Just make sure you have given the solder time to cool down before you go back to it. Don’t move the soldering iron back and forth; it just makes a mess. Rather, keep it in the same place and hold it on the solder until it melts. Then lift the iron tip vertically off the joint. You can clean the joints and redo at this late stage, yes. Use gravity as you say and (carefully) flick the solder off from the join. You run the risk of disturbing the cement underneath the lead in the process though. Just one question: Have you put your piece up with the light behind it? Are you SURE there’s too much solder? Only I bet your dad wouldn’t even notice; he’ll just be amazed and overjoyed at your gift. Think about this before you do it Lesley! I am desperate, the joints I soldered is all wrong, is there a way to remove all the solder and try again, otherwise the piece is no good.